Red raspberries belong to a collective of plants called the bramble fruits, which are members of the genus Rubus. These plants are characterized by having prickly stems and are considered to be somewhere between herbs and shrubs. By this we mean that the roots are perennial but the stems die down after their second growing season. It is during this second year of growth that the stems produce a single crop of fruit. 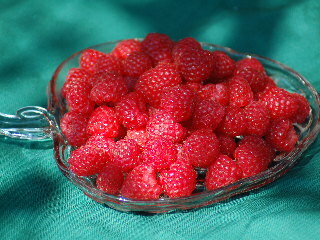 Since the plants produce new canes or stems each year, propagating themselves by suckers that grow from the underground roots, berries can be harvested annually once the raspberry plot becomes established. After the berries are picked from the second-year stems, these canes should be cut back to the ground to allow room for the first-year stems to flourish and strengthen in anticipation of their second year flowering and production of fruit. In addition to the red raspberries, other examples of the bramble fruits are the blackberries, dewberries, boysenberries, and loganberries. If you plan to grow raspberries yourself, take time to select the best planting stock you can buy and be careful of the location you choose in establishing your raspberry patch. Be sure to choose a site that receives full sun, and select a location that is far away from all wild raspberries and wild blackberries, as these wild-growing varieties can easily transmit diseases to your planted stock. Along these same lines of thought, this is the reason for purchasing high quality nursery stock—to be assured that the plants are certified to be free of diseases and viruses. Set plants in rich, well-drained soil that contains lots of organic matter. As your raspberry patch becomes established and starts to produce edible fruits, you will have the happy predicament of deciding how best to consume your homegrown produce. The raspberries can be frozen or made into jams or jellies, of course, but the easiest and tastiest way of consuming them is in their fresh natural state. If the berries are not to be eaten soon after they are picked, they should be refrigerated without washing in order to preserve maximum freshness. Rinse them under cold running water only when you are ready to serve them. The berries can be served alone in their natural state or as a topping for cakes, puddings, or yogurt. They are a tasty and nutritious ingredient in the making of pies, muffins, pancakes, crepes, homemade ice cream, or other desserts. 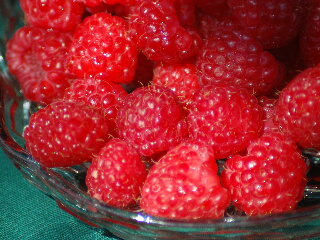 Red raspberries are a low calorie treat (only about 60 calories per cup). They are also a great source of insoluble fiber in your diet, and much more delicious to the taste buds than other sources of fiber such as bran or some of the denser whole grains. In addition to great taste and fiber, red raspberries also provide a healthy dose of potassium, which can be helpful in controlling elevated blood pressure. Pick them fresh from your own raspberry plants, or pick them up from the fresh produce department at the market, but add the tasty nutrition of red raspberries to your diet.